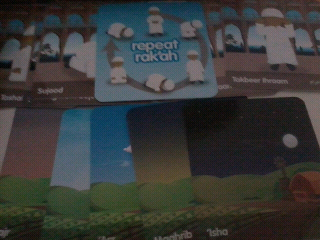 The first five days of ramadan has passed, subhan Allah. We have reviewed from last year and made new coloring books together as the old ones got lost in our shifting, alhamdulillah. 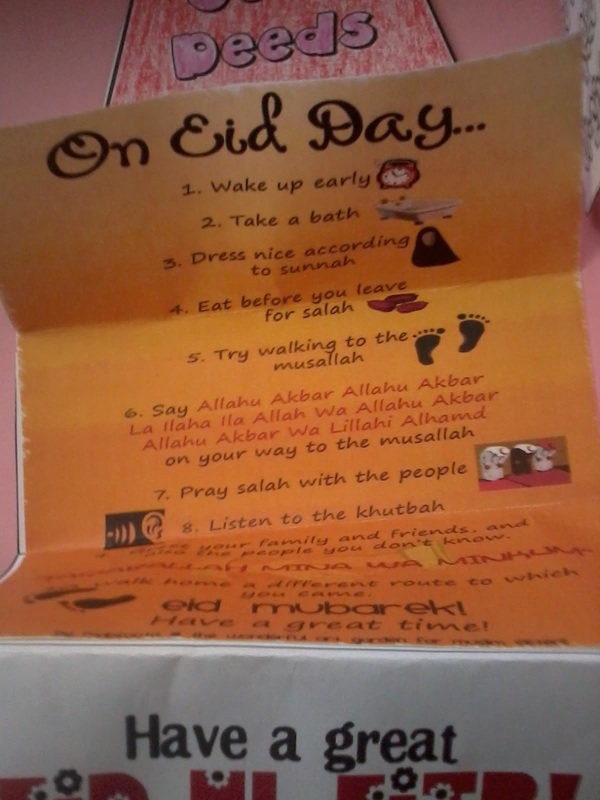 And we did this activity from the ramadan activity book for young children from a muslim child is born wih the dua for opening the fast. 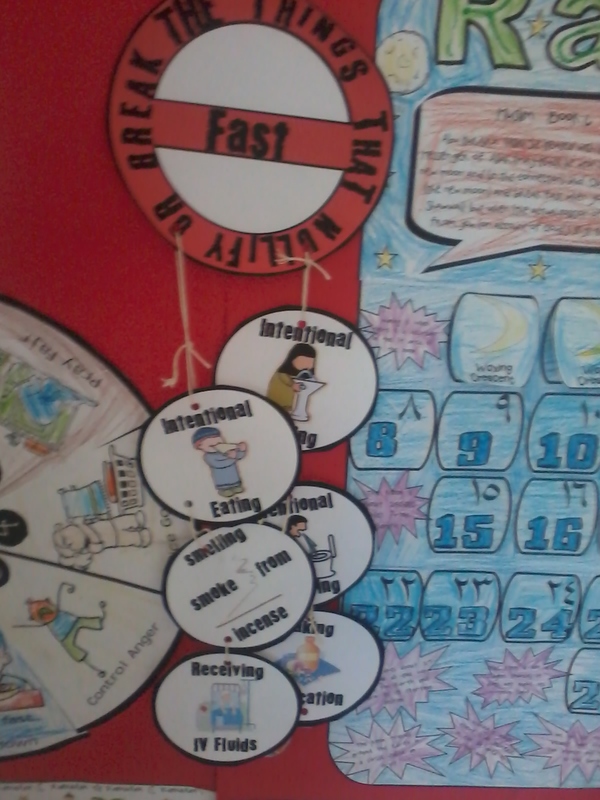 On the second day they we learned more about a fasting day. Using the sequencing cards from umm abdul basir, we cut them out together and discussed each one and their possible order. 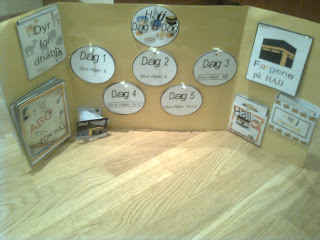 Then we agreed on the order and glued the correct numbers on the back of each card. Then they practiced to put the cards in order looking at the pictures and self correcting by turning over and check with the numbers. 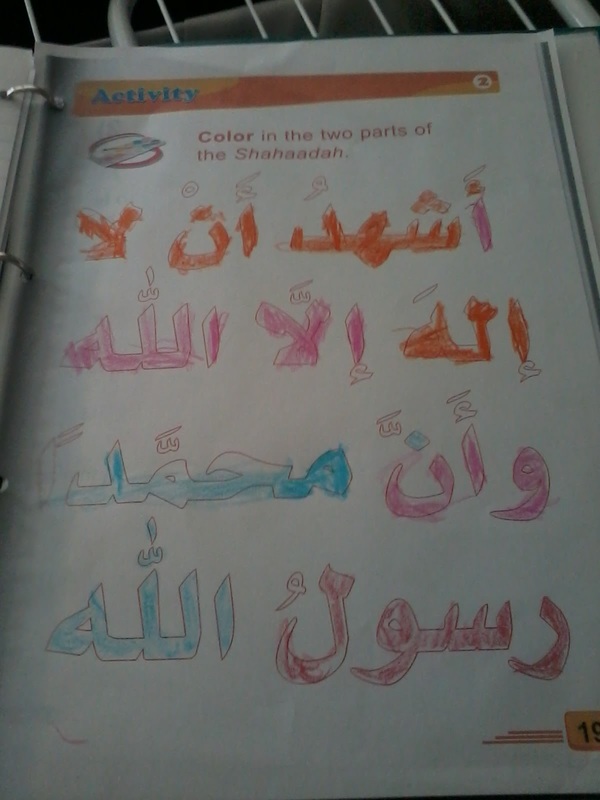 Alhamdulillah, a very nice practice for several skills! 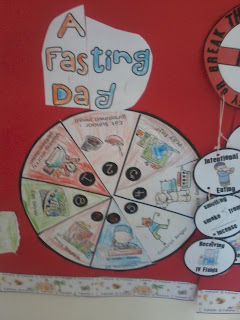 We also put up the fasting day wheel from the islamic bulletin board resources at our board. 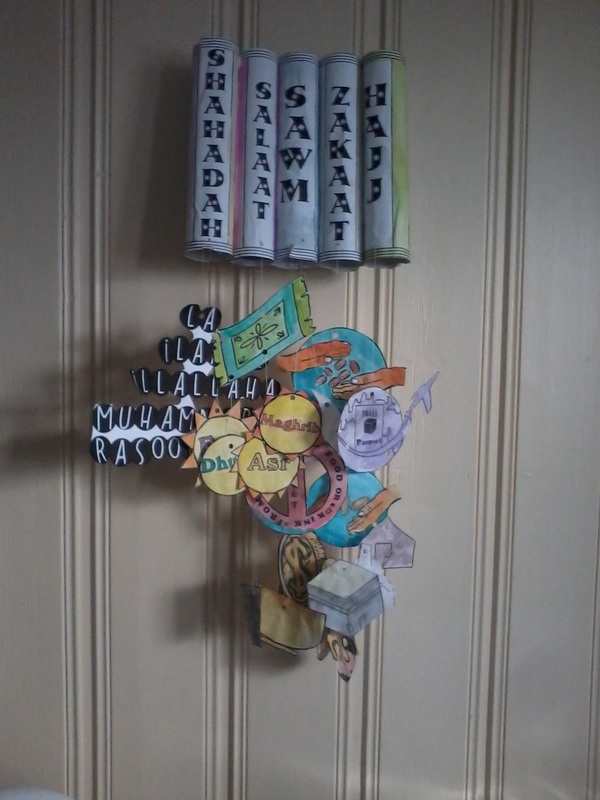 On day three we learned about some nullifiers of the fast and we made ourselves a new mobile as last years also did not come with us qadr Allah. 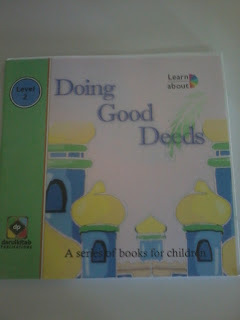 On day four we read the book about doing good deeds from dar ul kitab and discussed each one and how we can implement it, then we cut out good deeds trees from the Smart ark/Umm Maimoonah Ramadan pack and made ready the batches for good deeds, they started competing in good deeds from that very minute, Allahumma baarik. 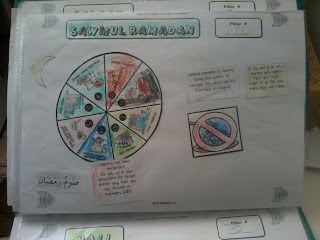 On day five I encouraged them for the first time to make a visual journal entry about their experiences so far in ramadan, inspired from Maimoonahs enries last year, tabarakillah, and from Umm Tafaris blog from last year, that is no longer accessable qadrAllah. First they painted one piece of paper with water colors of their choice (they chooed the same) and left it to dry while they worked on a new sheet of paper. 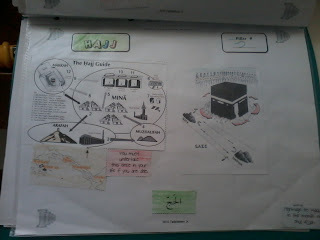 Here they draw and colored things they remembered from the last few days masha Allah while we discussed, after we cut it out and glued the drawings on the painted paper and then they decorated some with glitter glue. 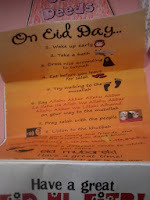 Masha Allah, they had a good time and we did a fun an nice review while doing this alhamdulillah. Here you see many things, from amongst them the hilal with stars, and an ice cream with a not allowd sign on it as its not allowed when fasting. A sun as the weather has been sunny everyday, a bicycle as they ride their bicycles in the garden after Asr, someone making salah and a plate of suhoor and the writings about breaking the fast and suhoor beneath it and a plus sign for additional things.. children has many things in their minds masha Allah. 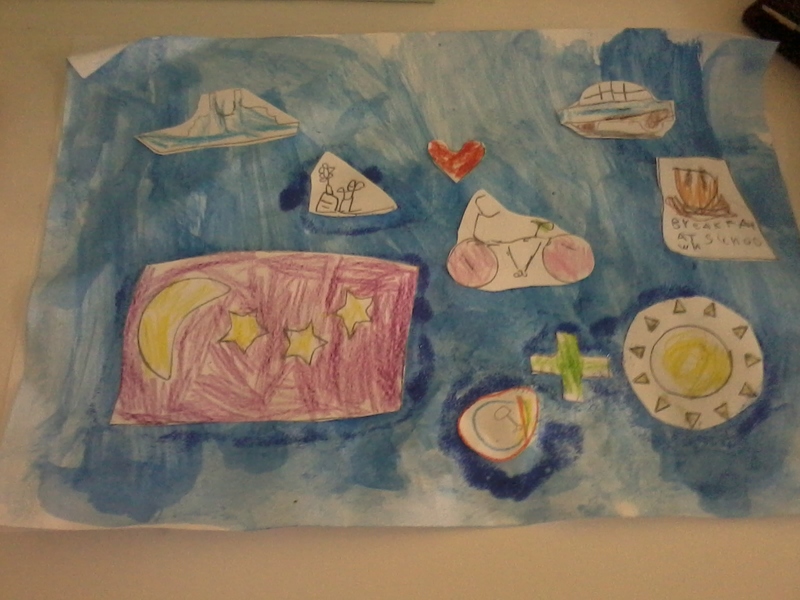 There is also a heart, a car and a boat that is there for some reasons Im not sure. Here is stars, sun, a cloud with rain as has been the weather were we used to live, dates, and M for mama, someone waking up for suhoor, heart, circles, squares and the like as she is learning the shapes in english these days I guess. 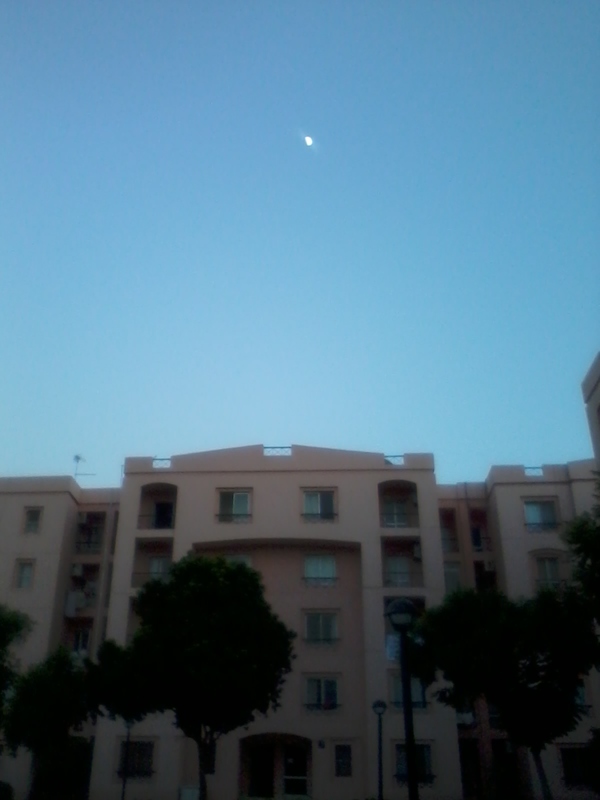 This is the moon of shabaan, maybe 4 days old above our building, subhan Allah. 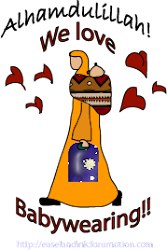 We are hoping to go out and try to sight the ramadan moon inshaa Allah, even if we does not see it I hope it will be a special event and a joyus time for the children inshaa Allah. 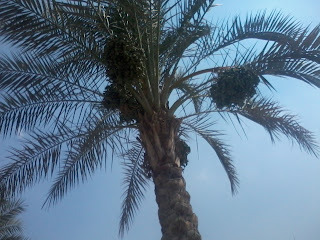 We also have lots of date palms here, masha Allah. 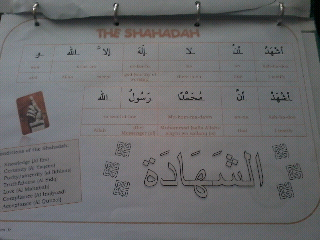 Now we see the dates are being all green and fresh masha Allah. Most of the dates sold here a local, subhan Allah, I love that. 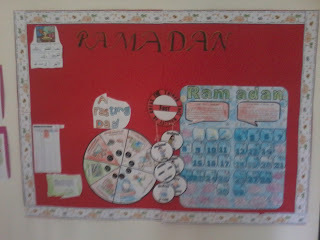 It was actually the kids who noticed the dates first, and they remembered last years ramadan date three craft. 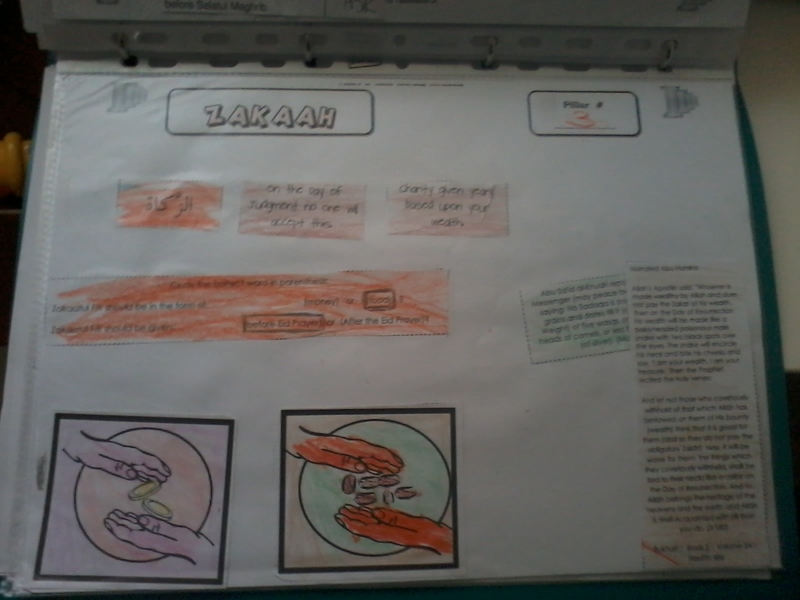 Hands on learning really stick bifadlillah. 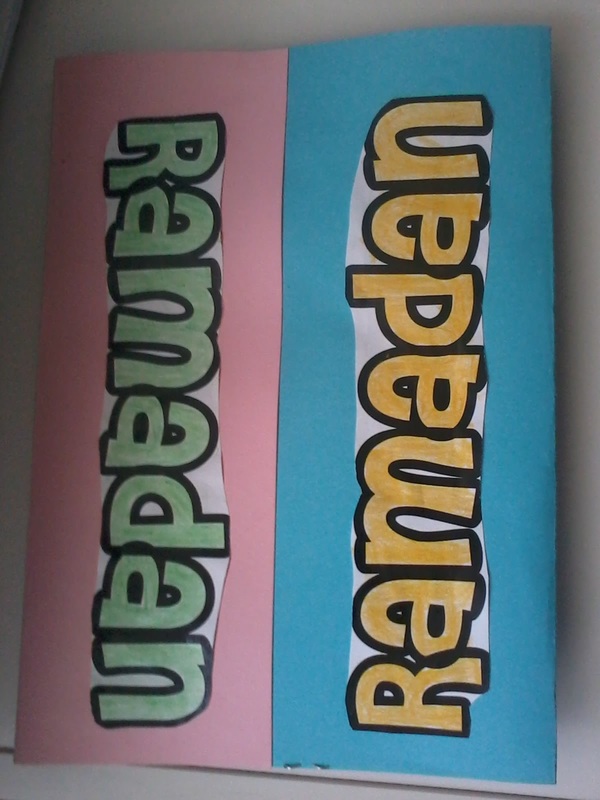 We have already made a ramadan decoration for our door, pictures are coming inshaa Allah. 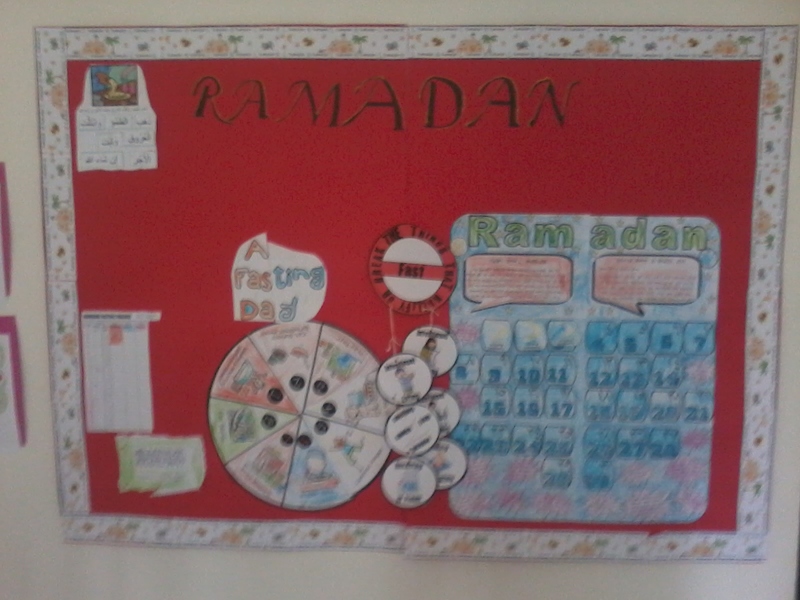 And we have made a big bulletion board were we will stick many of our ramadan activities and calendar inshaa Allah. 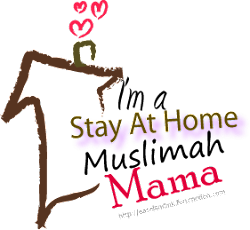 Hope to share with you some of our acitivities soon bidnillah. 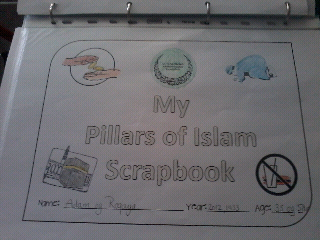 Question: Could you please tell us the ruling on young children learning about Islaam and Ramadaan through nasheeds, videos, cartoons and the like? 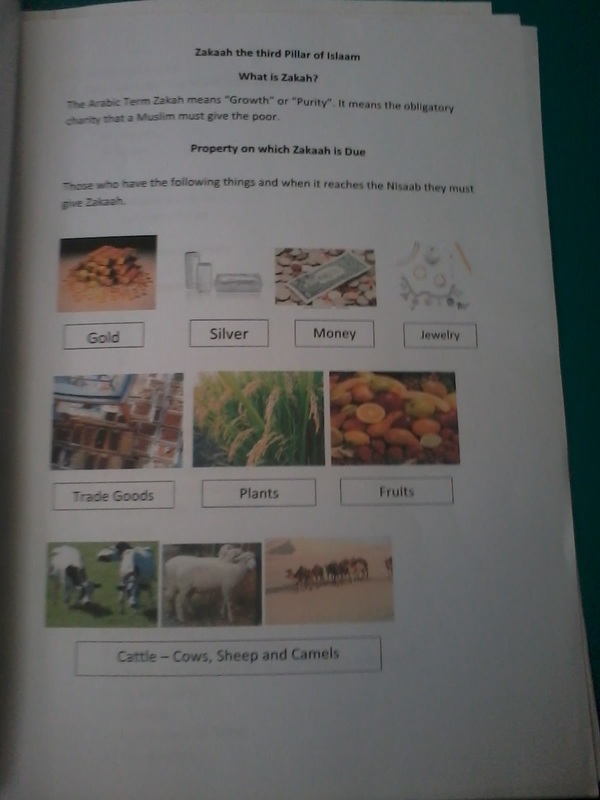 Answer: Wallaahi this issue has spread in the Muslim world today. 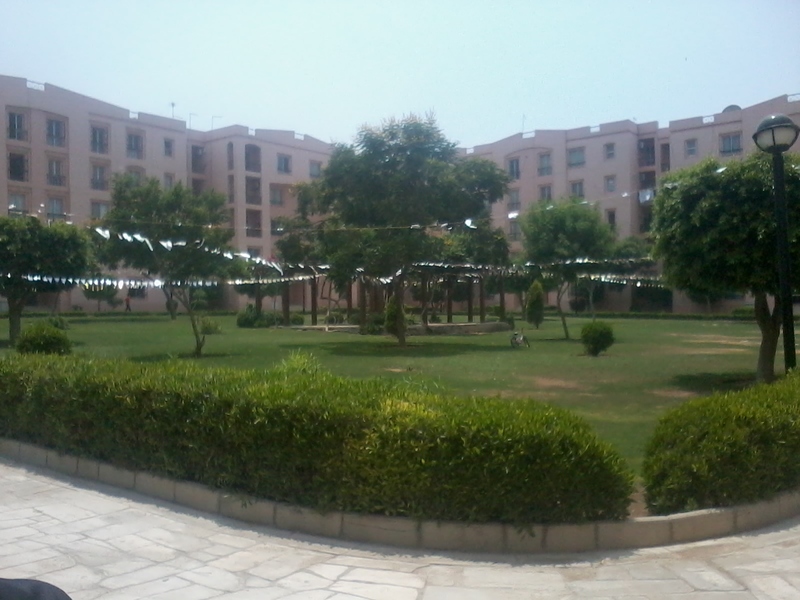 It started as a means of teaching but now it is a form of material enjoyment. They are not able to do without it and this is really bad as it will lead to the days of the Sufis â€“ where they used to worship Allaah by anaasheed and they called it Islaamic songs. There are no Islaamic songs. 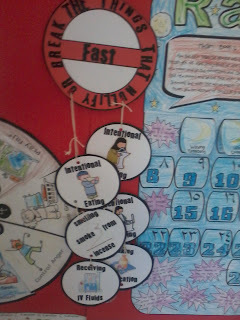 â€¦until the end of the hadith. This hadith today, (words unclear it sounds like: â€œdegrees of speech are being done on it. 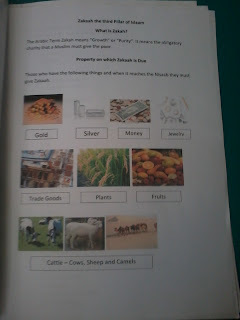 Teach Deen.â€) Notice how this hadith is given to a little boy â€“ why? 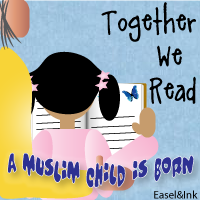 So that he would grow up with this understanding; let them (our children) grow up with Qurâ€™aan, recitation and duâ€™aa â€“ teach them what will benefit them. These things â€“ anasheed and cartoons will make them happy because they donâ€™t differentiate between good and bad, but they will love it and they will live with it until they die. These things will remain (in their minds). As Shaykh Muhammad Mukhtar ash-Shanqiti حفظه الله said in a lecture when he was asked about the anasheed for the students of tahfeez (memorization), he said â€œNo, donâ€™t make it a hobby for them because what will happen is whenever anasheed is found they will come and when anasheed is stopped they will turn away from Qurâ€™aanâ€ â€“ they turn away from tahfeez (memorization), they turn away from religion. Thatâ€™s what we observe. 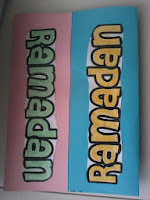 Look to the â€˜Ulamaa. 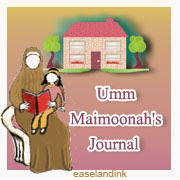 Do you want your child to be from amongst the â€˜Ulamaa? 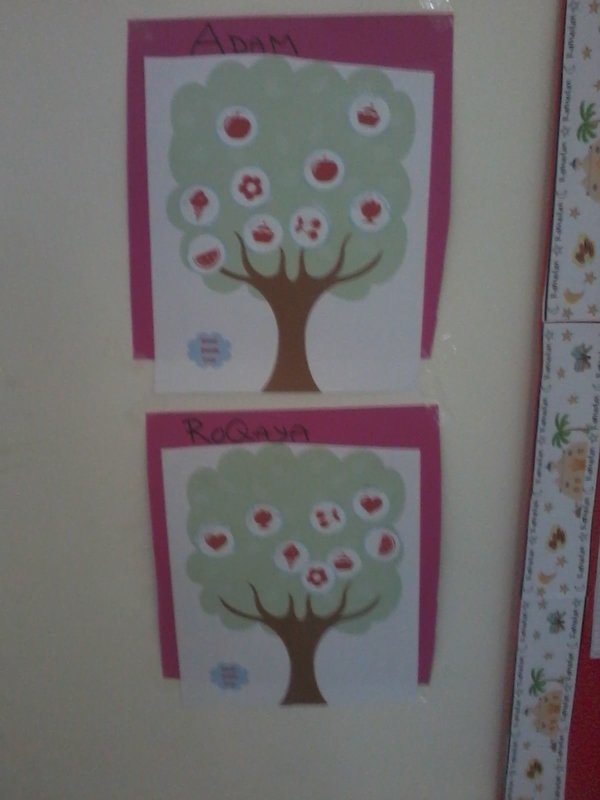 Okay, take the biography of Shaykh Ibn Baaz and the biography of Shaykh Ibn Uthaymeen and see how they grew up. I challenge anyone to show me that Shaykh Ibn Baaz, Shaykh Ibn Uthaymeen, Shaykh al-Albaani, Shaykh Muqbil, Shaykh Fawzaan, Shaykh Luhaydaan grew up listening to anasheed or cartoons. No! they grew up in a serious manner. 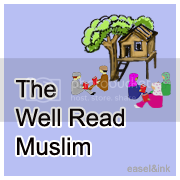 They were in the halaqah (circles, sittings) of the shuyuukh; and in the house their mother reviewed what they studied and encouraged them in increasing in memorizing the Qurâ€™aan and studying the Sunnah. They gave them sweet etc. (as an incentive) because they wanted to encourage them, and that is why when they became adults they became more serious than others. Shaykh Ibn Baaz said that when the children used to play he always used to stay with the Qurâ€™aan. 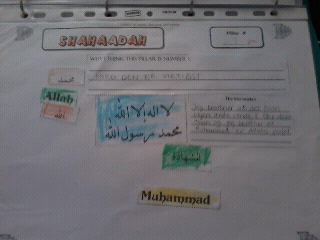 Akhi, Subhanallaah, who are the children who were with the Shaykh? We donâ€™t know them; he didnâ€™t mention any of the scholars of today who were his friends in boyhood. He did not mention them and this means that all those children went only to the dunya (got caught up in worldly affairs), but by staying with the Qurâ€™aan he رحمه الله became the noble â€˜Aalim, the noble Imaam of his time. 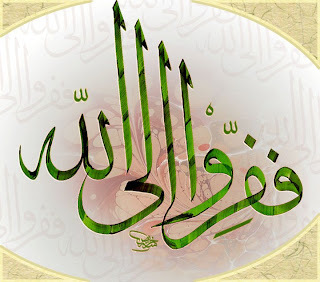 This also pertains to the other great and grand â€˜Ulamaa. The young will become young (grow into adolescence) as he was raised by his father (upon what his father got him accustomed to) when he was a boy. 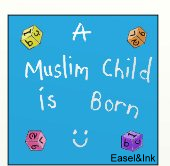 If he was left to anasheed and cartoons he will love it and grow up with it and live with it. Wallaahi, I saw brothers in the Jaamiâ€™ah (University) and some of them were in the Faculty of Hadeeth playing games on the mobile phone or on the computer. 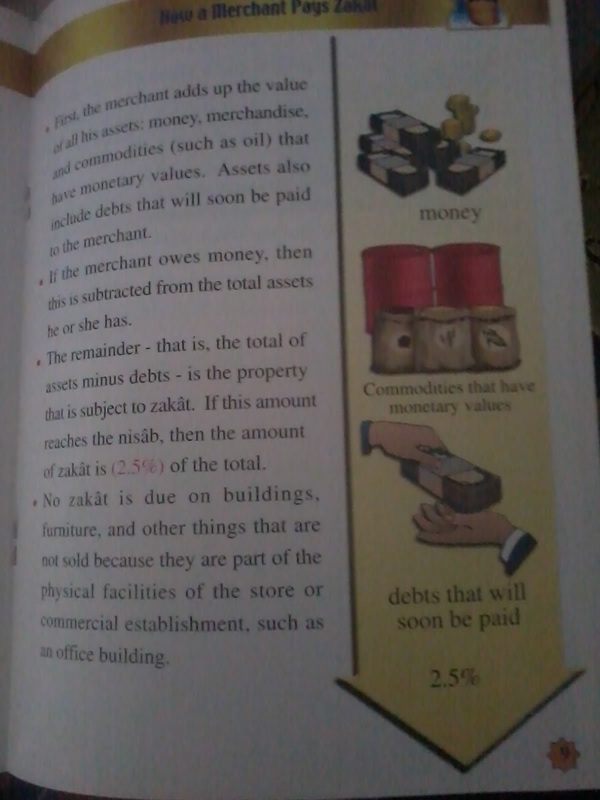 Subhanallaah, is this what they are created for, they are Taalibul â€˜Ilm (Students of Knowledge). 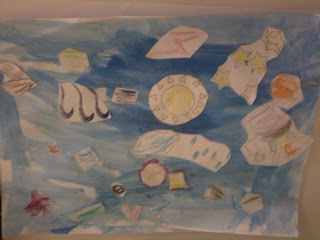 When I asked them why, I found out that from their boyhood days they lived with that. However, notice that those people who are always involved in seeking knowledge, teaching knowledge and busy in Qurâ€™aan recitation â€“ you always see when they become adults â€“ men or women, and when they become old you always see them in those fields and people will have a need for them. But people of anasheed nobody needs them. Yaa Ikhwaan we have to realize the difference between what Allaah تعالى created us for and work towards it, and what is to be found from enjoyment. 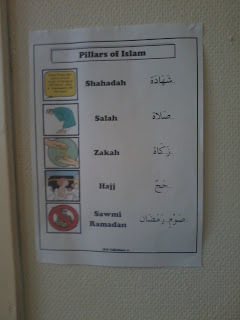 Wallaahu Aâ€™lam. 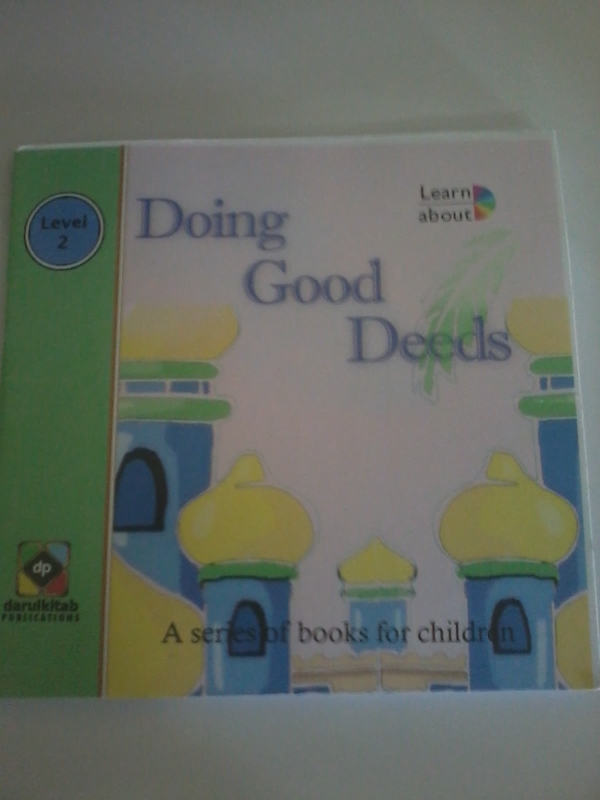 Reported as part of a longer hadith. Shaykh al-Albaani رحمه الله says Saheeh in Saheeh al-Jaamiâ€™ (#7957). 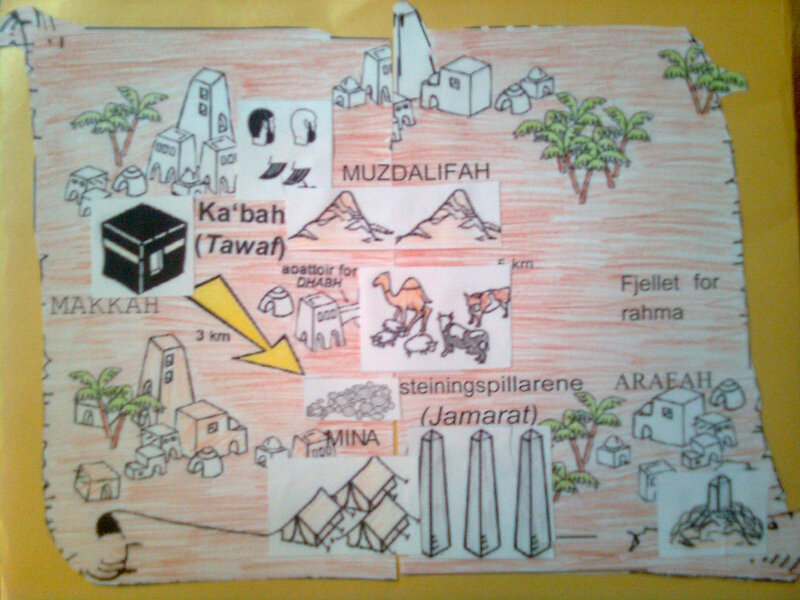 Also found in an-Nawawiâ€™s 40 Hadeeth as hadeeth #19. 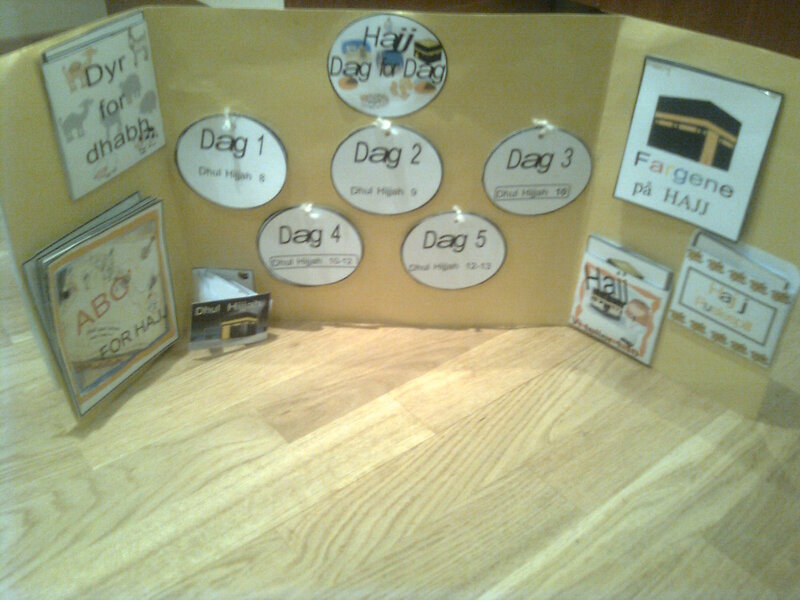 One of the jamaats in Norway have put together a new site for muslim children with learning tools, games and coloring activities alhamdulillah. 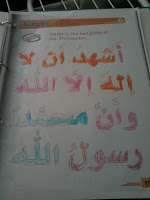 They have even made coloring books (printables) with islamic Fawaaid in norwegian without living creatures may Allah reward them. The site is in norwegian and will be suitable for any who knows the nordic languages inshaa Allah! 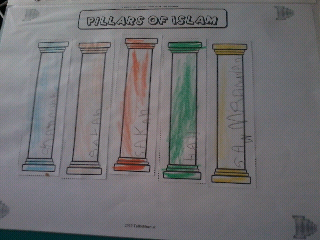 As a part of our KG curriculum put together by Umm Maimoonah I introduced them to the five pillars of islam. 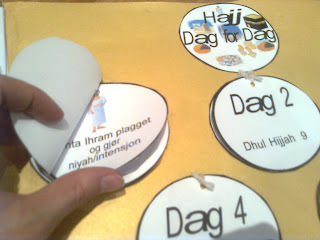 I started by telling them what a pillar is (the word is søyle in norwegian and not that commonly used at least not in our family) and illustrating how a building needs its pillars to be steady with wooden builiding blocks. They have repeated that a lot by themselves when playing after this. 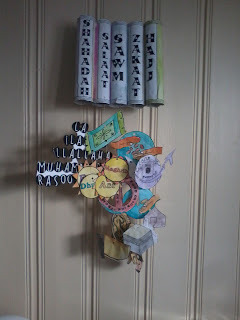 After that I illustrated it in anouther way with a book we used to read a lot a few months ago and it shows how a house is build on pillars to make a steady foundation. 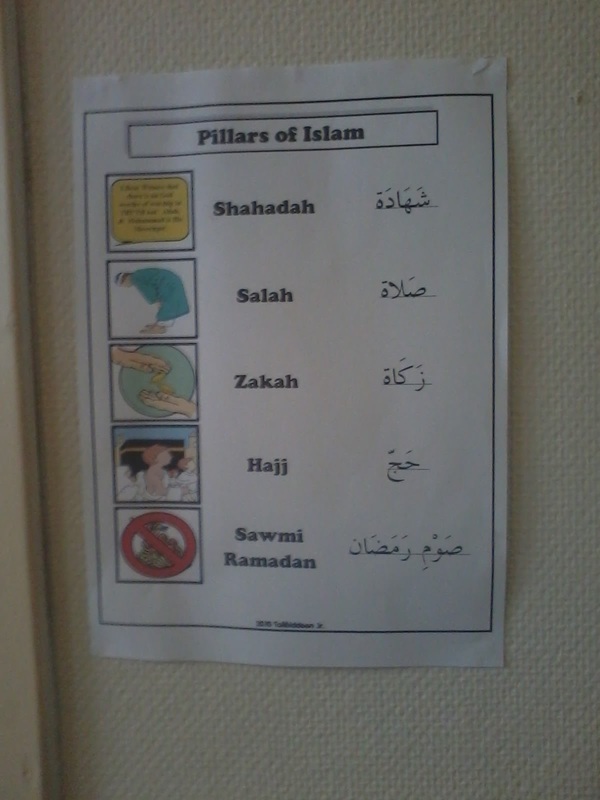 I then I showed them the TJ poster and explained that this is the pillars of islam and its our foundation and what every muslim must know and practice. 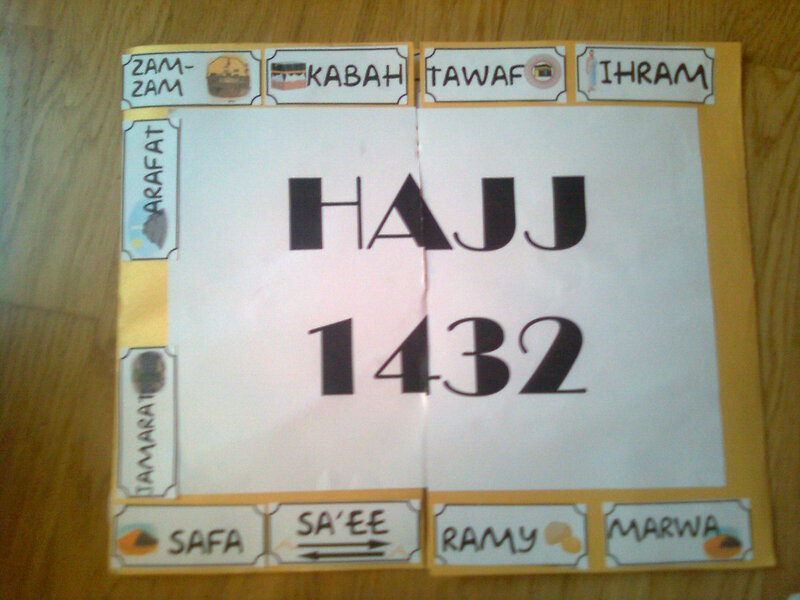 After that we talked about Salah, they remembered the names of the different salawat and they knew their order. Then I explained what a rakaa is and we went through it with the learning roots cards. 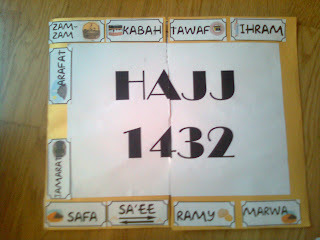 I asked them if they had ever noticed that some salah are recited loudly and others silently and they had and I told them which that were recited load and which not. 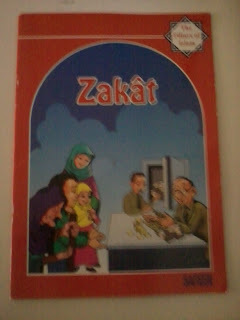 We then read a book about salah together that a familymember brought us from a travel and it explained things very nice. 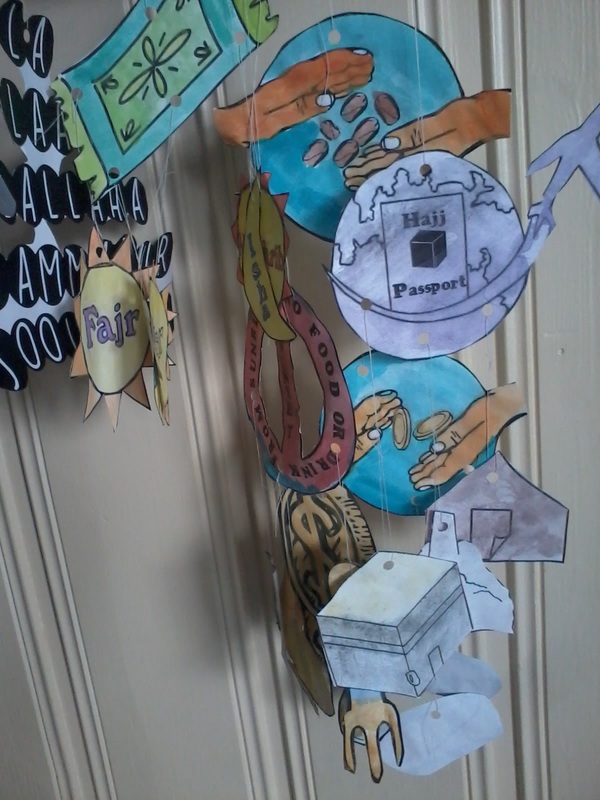 Then we started the Five pillar scrap book from TJ and we made the pages together and discussed about its contents. 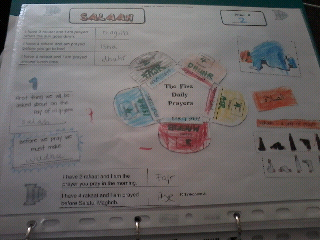 Then we did salah f.ex wudhu and that salah is the first thing we will be asked about on yaum al qiyama. 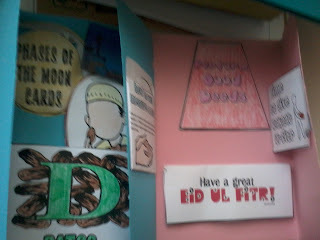 They also reviewed adkhaar for rukuu and sujuud. Then we talked abot Sawm Ramadan and we looked at our Ramadan lap book from last Ramadan to review about that alhamdulillah. 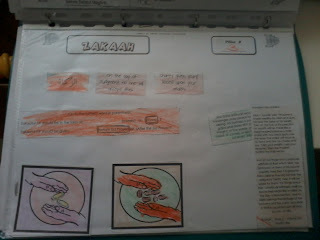 Jazakom Allahu khairan for comments, regular visits and support. 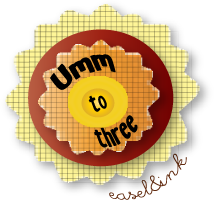 This post is for my readers who have followed our journey through our first year of home educating and the new who just discovered my blog! 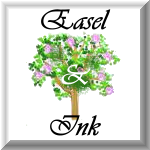 I have now decided to change my ways fisabilillah, I have removed my previous entries and will edit and re post according to the following inshaa Allah. 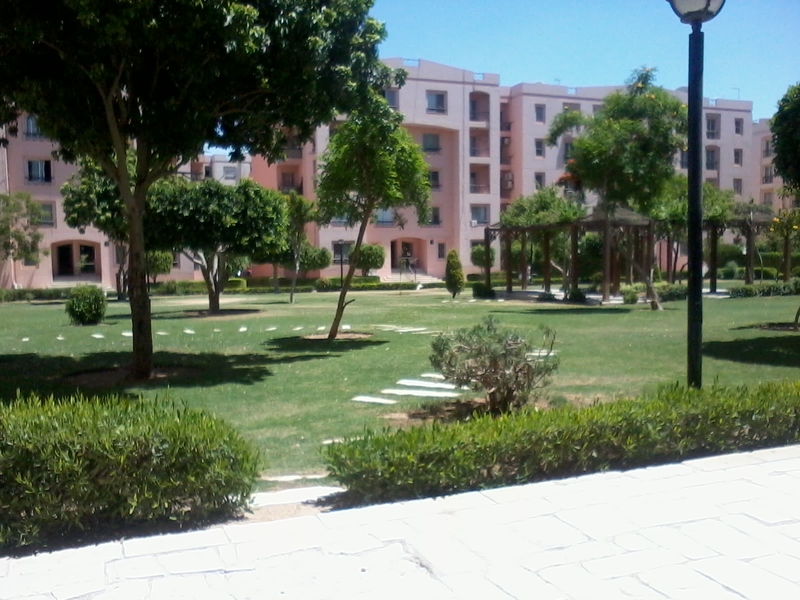 Because I will continue to share our journey but limit personal experience a lot more, I will no longer include pictures who shows living creatures at all insha Allah and refrain from a tone which I would not use when talking to an unknown person and certainly not with people that are not my mahrams. 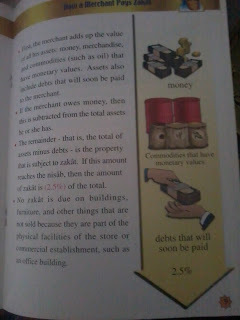 I ask you all to understand this and I hope that a lot more of you will benefit from the blog in the future bidnillah. I pray that Allah forgives my mistakes and accepts my repentance for that which I know of and that which I do not know and I pray the He rewards the sister who gave me naseeha in a respectful and beautiful manner and accepts from all of us our efforts done for His sake and our actions to gain His ridouan (contentness).